I offer two styles of fine art prints: prints on cotton paper and prints on cotton canvas. Because my style emphasizes simple compositions, people often mistake my photographs for paintings. Using that analogy, a print on cotton paper looks most like a water-color painting while a print on cotton canvas looks more like an oil painting. Which you choose will reflect your personal tastes and preferences. I print my photographs with archival pigment inks on pure cotton paper or canvas: materials and methods that are more environmentally friendly than traditional photographic processes. And unlike traditional color photographic prints, with a lifespan measured in decades at best, this combination of materials will last, with care, for generations. Prints on cotton paper are available in the following sizes: 5x7, 8x12, 12x18, 16x24, 20x30, 24x36, and 30x45. The two smaller sizes are open editions and the larger sizes are limited editions. Each is titled and signed—and the limited editions are numbered—on the paper just below the image. Open editions can be printed as long as there is demand. Limited editions can only be printed to the stated limit. In general, I limit 30x45 and 24x36 prints to an edition of 25, 20x30 and 16x24 prints to an edition of 50, and 12x18 prints to an edition of 100. All prints are made on a piece of paper that provides a generous margin around the print for matting and framing. Once you’ve selected the size of print you would like, you can choose to have it matted. I offer simple natural white cotton mats that complement my work well. The mats are cut to reveal a ½ inch border of paper all around the print. This elegant look also assures that the title and signature are visible below the print. I do not offer mat or framing options for 30x45 prints because shipping would be prohibitively expensive. The finest archival materials and methods available are used to mount and mat your print. I use only pure cotton mat board that has been buffered with calcium carbonate to protect your print from environmental contaminants. I include an acid free foam core backing board so that you will have everything you need to frame your print except the frame and glazing. Your print is mounted to the back mat using acid free tape hinges—the technique preferred by museums and fine art galleries. 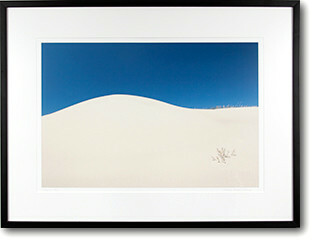 I also offer a selection of frames that go well with my prints and mats. The frames include UV resistant non-glare acrylic glazing. If you order a framed print I will assemble the entire package and ship it to you complete with D-rings and coated wire attached so that it is ready to hang. The outside dimensions of the frames is approximately 2 inches more than the mat sizes listed above. The mats and frames I offer have been chosen to complement both my work and a wide variety of decors. But the selection is necessarily limited. I encourage you to consult your local frame shop if you’d like to explore other options. Prints on cotton canvas are available in the following sizes: 12x18, 16x24, 20x30, 24x36, 30x45, 36x54, and 40x60. All are limited editions. I generally limit 30x45 and larger prints to an edition of 25, sizes from 16x24 to 24x36 to an edition of 50, and 12x18 prints to an edition of 100. 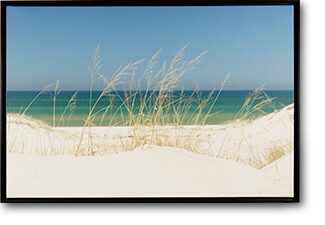 Prints on cotton canvas are sealed with a UV and water resistant semi-gloss coating, and stretched on stretcher bars. Each is initialed in silver on the front, and signed and numbered on the back. The software I use to print on canvas mirrors the image around the edges, so you can hang a stretched canvas without a frame for a very simple presentation. I offer a selection of floater frames to complement my canvas prints. A floater frame leaves about ¼ inch of space between your stretched canvas and the frame, creating the appearance that the canvas floats within the frame. It is a simple yet elegant look. If you order a framed canvas I will ship it to you complete with D-rings and coated wire attached so that it is ready to hang. If you have any other questions about my prints, mats, or frames, please feel free to drop me a line or give me a call!